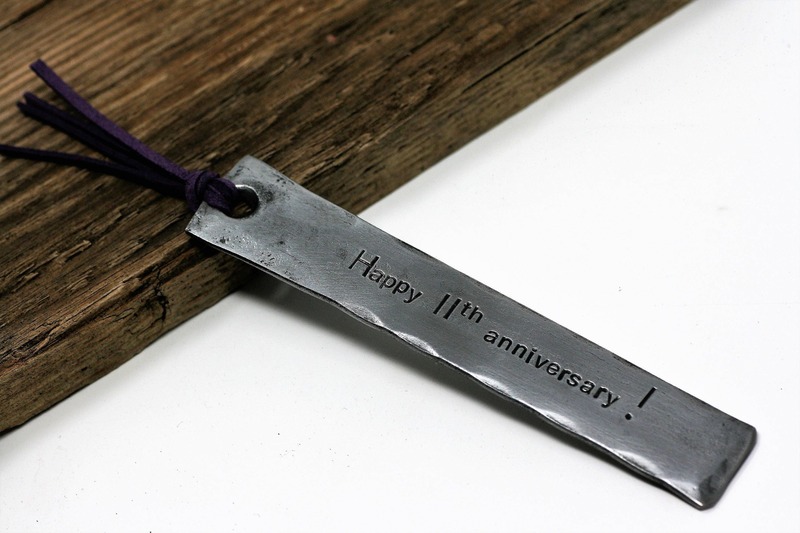 Fantastic Steel Gift for your 11th Anniversary. 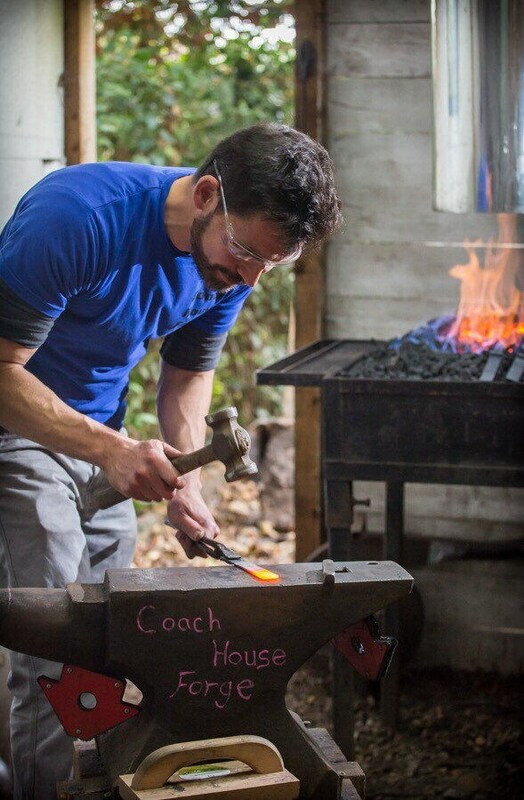 Each metal Bookmark is hand forged by Blacksmith Chris using hammer & anvil to create a truly unique, one-off item. 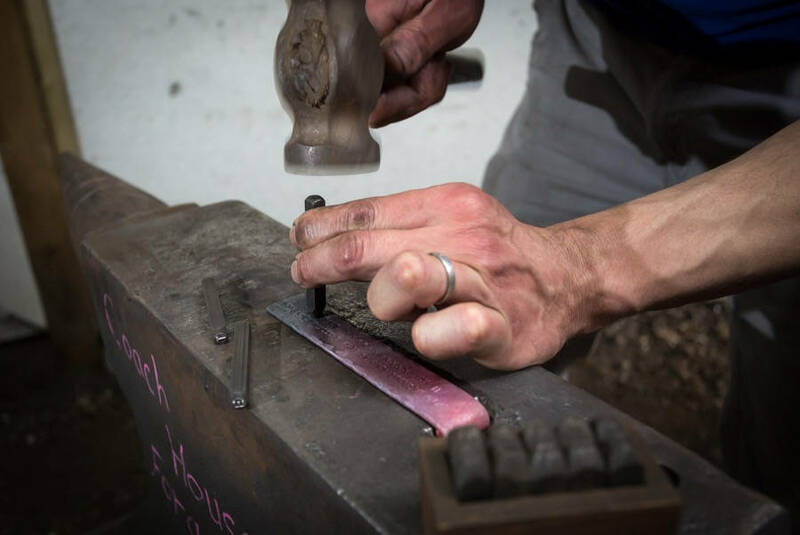 Once the steel is forged they are cleaned and polished to a high shine and then coated with wax to create a protective and attractive patina. 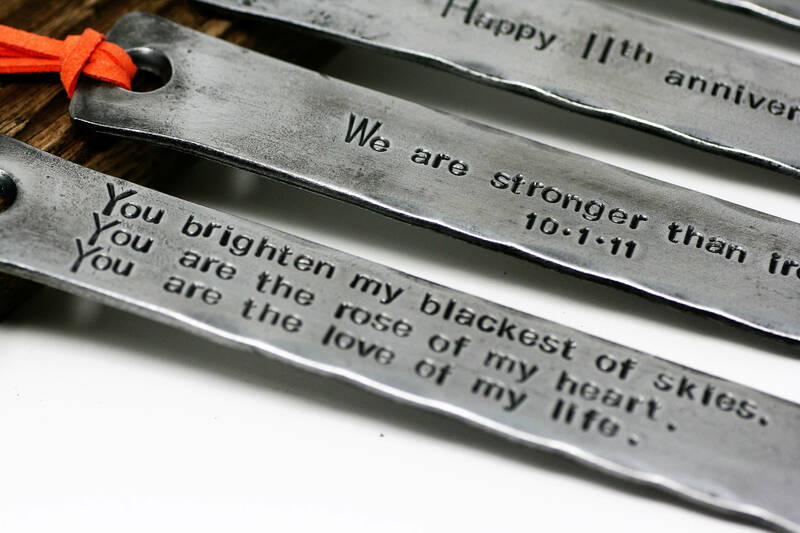 They're ready to be personalised with your own message or favourite quote - We use individual vintage letter & number punches to hand stamp the metal Bookmark. 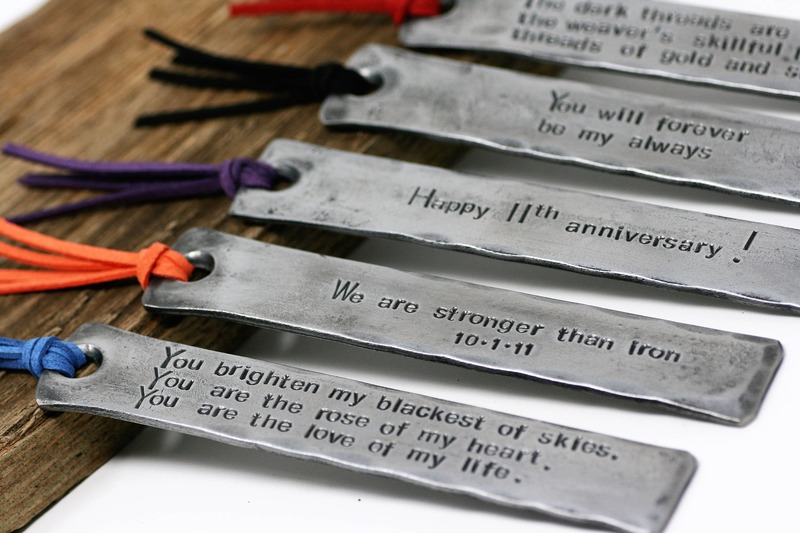 The perfect 11th steel wedding anniversary gift for your wife of husband . Fast Processing and Worldwide shipping. * Compose your personalized message & count the number of letters/numbers/punctuation marks (you don't have to count spaces). * At checkout select the correct pricing option from the dropdown box-for example if your message is 25 characters long, select the 21-40 character option. You can also contact us using the 'Ask a question' tab. * Please specify where you want the text stamping- front, back or both and if you have any preferences regarding the layout otherwise we will use our best artistic judgment. * Once we receive your order we will send you a confirmation Email. Your bookmark will then be made within 5 working days! * Forged from steel bar and cleaned to a polished shine. 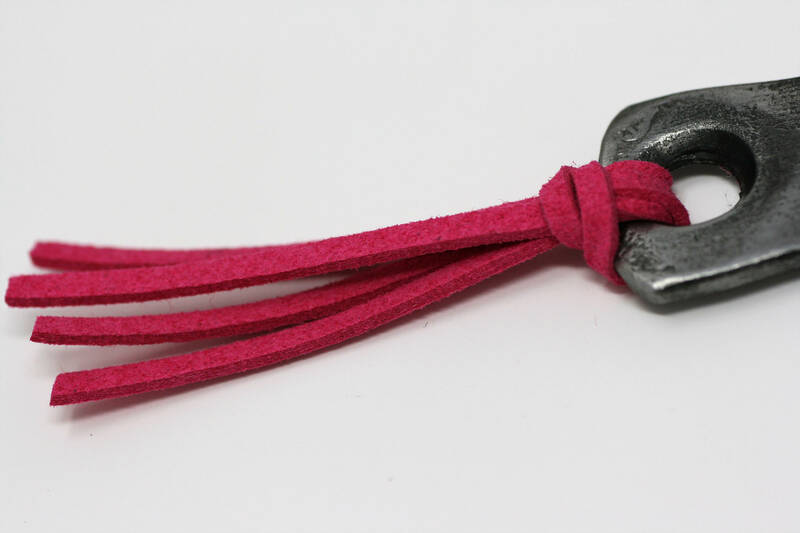 * Available with a choice of 7 'Faux' Suede Leather cord colours so you can find your page! 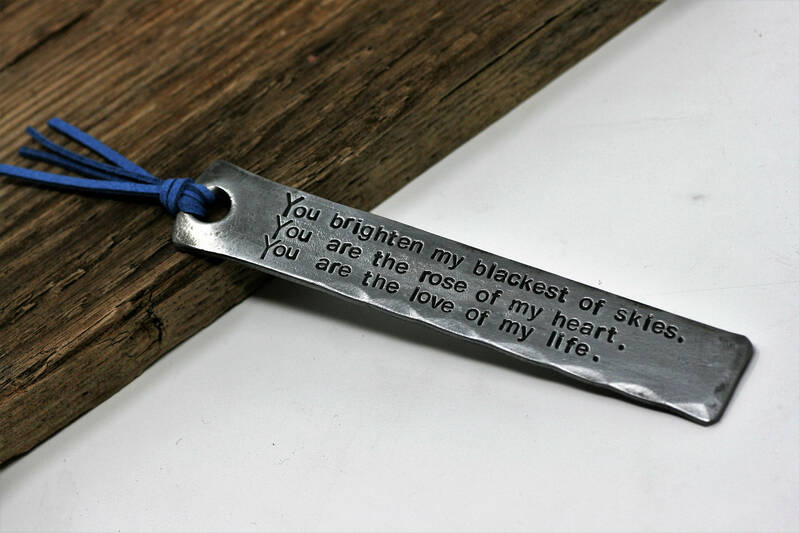 * Can be hand stamped with up to 100 characters on the front, back or both. * Shipped in a black microfiber pouch ready for gifting. * Option of standard, tracked and express shipping. * If you require more than 100 characters please request a custom order and we'll get right back to you! 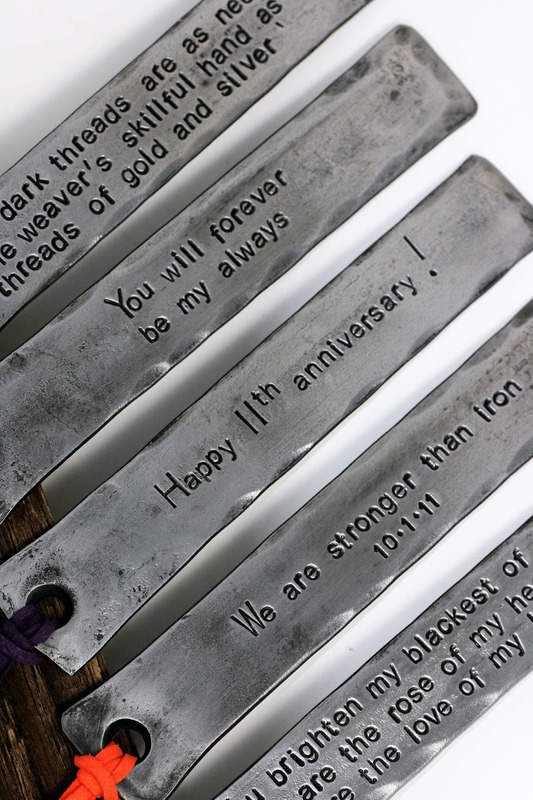 These make a fantastic gifts whatever the occasion so get composing that message or inspirational quote and together we can immortalise it in STEEL!!! 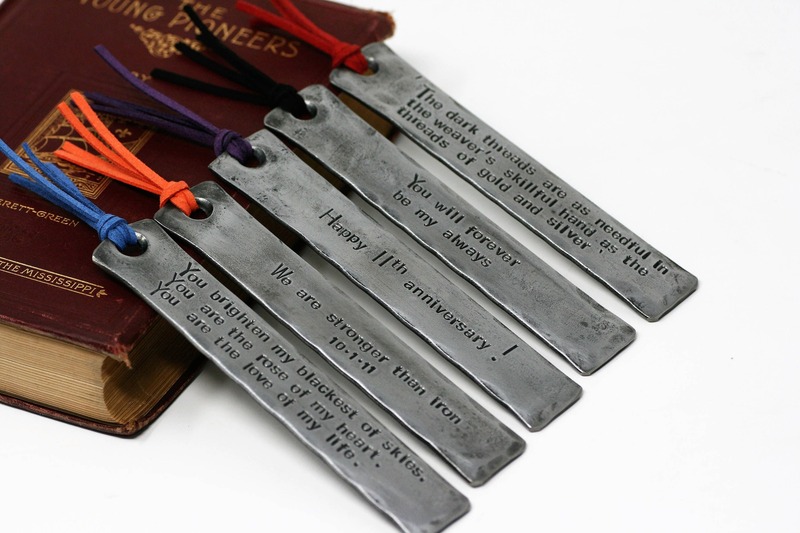 My husband loved the steel bookmark that I ordered for our anniversary. The engraving was done nicely and it was the perfect gift for the man who has everything! I bought the bookmark as an eleventh wedding anniversary gift. It was well received. The bookmark is weighty, as should be expected from a quality item. Order shipped like the next day. I was very impressed with the turn around time; especially since it was an anniversary present. The product engraving was also just as described. Makes for a very unique and personalized gift. My wife is a huge book reader so will get lots of use. Thank you! 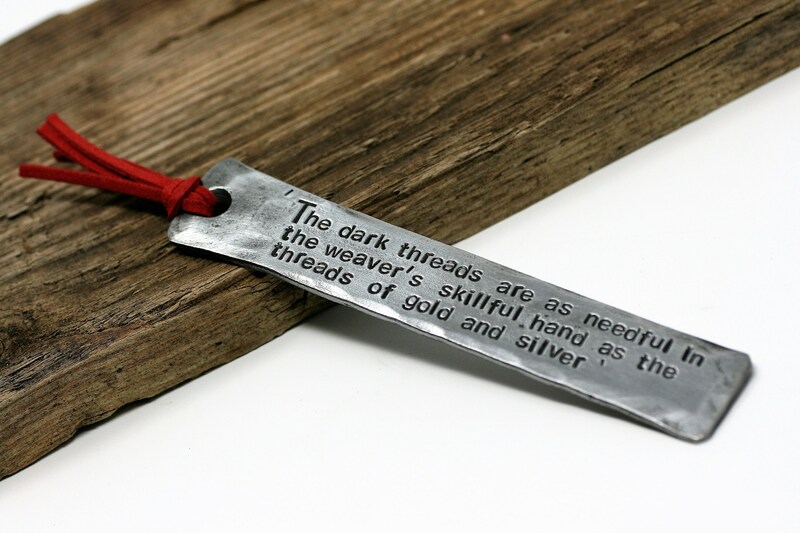 The bookmark is fabulous, such high quality - I was so impressed when it arrived. Also a huge thanks to Chris for keeping me updated, answering my questions and shipping it so quickly for me to meet my deadline. Absolutely great service and product!